Foils, it seems, are coming to powerboats. Introduced on America’s Cup and other racing sailboats a few years ago, they are now being tested and launched on recreational powerboats. 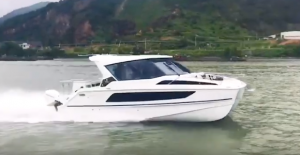 At the Miami boat show, Aquila announced it would offer foils as a $27,000 option on their 36-foot cruiser, while in France, Beneteau announced that they had just tested foils on a 31-foot prototype. In Miami, Lex Raas, the president of Aquila (part of MarineMax), displayed a model of the foil that sits between the hulls of the Aquila 36 catamaran. There’s a relatively large foil in the middle of the boat, separated by the two hulls, and two much smaller foils in back. The package is called the Aquila Hydro-Glide Foil System. Raas said the foils resulted in a 25 percent fuel savings, faster performance and a more comfortable ride. Powered by twin 350-hp Mercury Verado outboards, the Aquila 36, with two cabins and two heads, reaches speeds over 40 knots (see picture above). Raas said that after the 36, the foiling system would be offered on the Aquila 30. 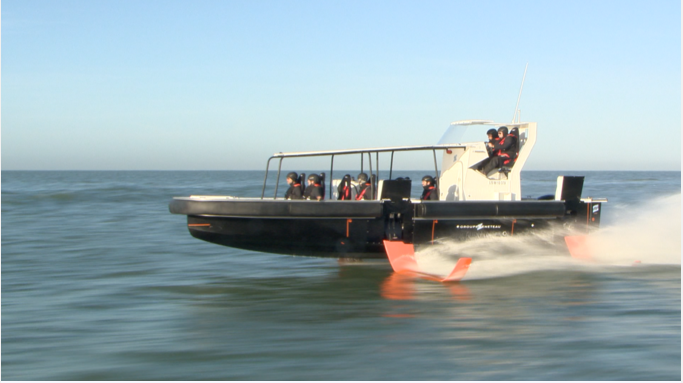 Meanwhile, in the February cold in Saint-Gilles-Croix-de-Vie in France, Beneteau tested its first powerboat foiling system (see top picture). It already has built foils on its Figaro Beneteau 3 sailboat. The company said that the “first flights” of the powerboat foil showed advances in fuel savings, total speed and cruising stability.